OH MY GOD… THIS IS WONDERFUL!!! Mango salsa is amazing! Looking for a tasty restaurant quality dish to impress your company or just yourself? 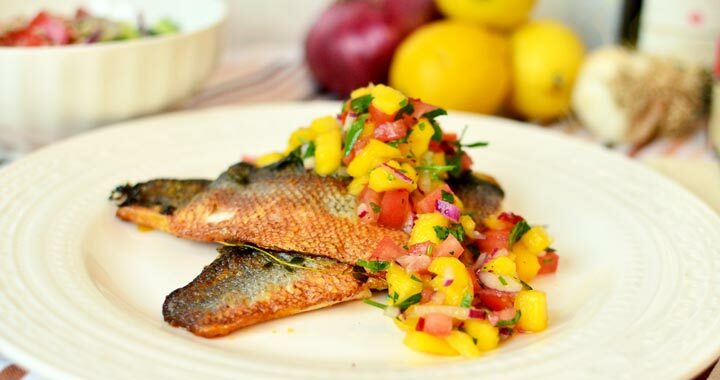 Try this amazing dish that combines the sweet and tart flavors of a mango salsa with white fish and impress yourself with the super easy presentation. This recipe is something I have been waiting to try for a while now. I have seen numerous people serve fish with mango salsa so I had to see what the fuss was all about. Well I can now tell you that the fuss is totally legit. Fish and mango salsa are awesome! Make sure you get the skin of the fish crispy as it adds a great texture to the dish. Cut up the mango into small cubes and add it to a bowl. Then chop the red onion and the tomato and add it to the bowl. Finley chop the chilli and garlic – if using – and add to the bowl. Chop up the cilantro and add to the bowl. Squeeze half the lemon juice on top of the ingredients, add a couple turns of pepper or a pinch and a bit of salt. Mix well and taste. Depending on how sweet/sour your mango is and your preference you may add the other half of the lime juice. Season with more salt and pepper according to your taste. Pat dry the fish filets and put them skin side down on a plate or chopping board. Season with some salt an add a generous pinch of cumin, cayenne and paprika to each filet. Crush and peel the garlic and take out the thyme springs and pat them dry. Put a large non stick pan on medium high heat. Add 3 tbsp olive oil and the garlic. Let the garlic cook until the oil is hot. When the oil is hot, move the garlic to the edge of the pan, scatter the thyme over the pan and add the fish filets on top of the thyme, skin side down. When you add the fish to the pan it will stiffen and curve upwards. Press them each down with a spatula to ensure even contact with the pan. They will relax after a few seconds. As you cook the fish skin side down, move the garlic around the pan with your spatula, turning it often so it does not burn. If it get’s too dark, break the cloves in half and turn them on their uncooked side. Watch the fish as it cooks, you will see the fish go from it’s raw opaque color to a white cooked color from the skin side (in contact with the pan) upwards. Cook for 3-5 min, until you see it has cooked about 75% (you should have just a bit of opaque uncooked flesh on the top, center of the filet) turn the fish over and turn off the heat. Let it cook in the residual heat of the pan for 1 minute. To serve, put 2 fish filets skin side up, crossed over each other, on a plate and spoon over the mango salsa. Serve with a salad to make it a complete meal. What is your favorite dish to serve with mango salsa? Let us know in a comment below and we’d love to try your recipe. Posted in Dairy free recipes, Gluten free recipes, Main dish recipes, Quick and easy recipes, Recipes, Seafood recipes, Sugar free recipes and tagged clean eating, easy recipe, healthy, mago salsa, mango, paleo, pan seared, real food, salsa, sea bass, sea food, whole food.